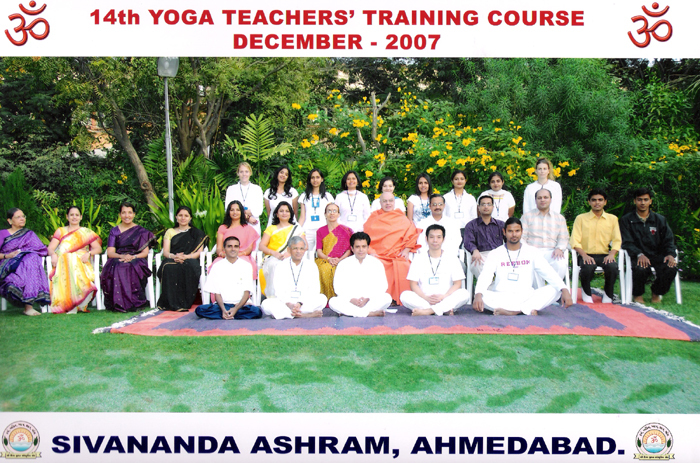 Students from U.K, Canada, Finland, Australia , Taiwan, Gangtok – Sikkim, Punjab and Gujarat participated in three weeks YTTC organized through Sivananda International Vedanta and Yoga Academy ('SIVA') of Sivananda Ashram, Ahmedabad from Dec 11, 2007 to Dec 31, 2007. All the students enjoyed their stay at the ashram. It was organized under the guidance and leadership of Sri Swami Adhyatmanandaji Maharaj and conducted by a team of yoga teachers, medical doctors & eminent scholars. On successful completion of the course each the student were received a diploma certificate by Sri Swami Adhyatmanandaji which is recognized by Gujarat University. 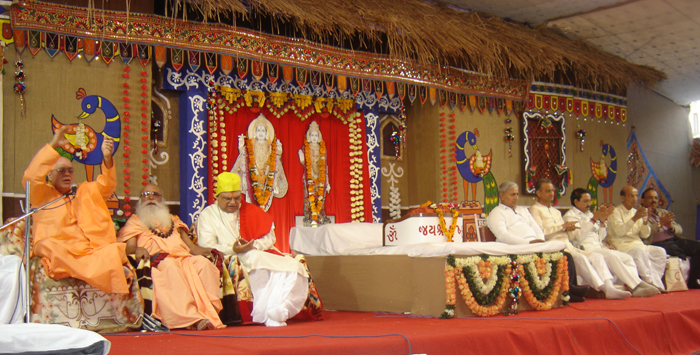 It was indeed a joy to celebrate Gita Jayanti in the holy presence of Maha Mandleshwar H. H. Sri Swami Satyamitranandaji Maharaj on Thursday Dec 20, 2007. At a satsang, devotees recited Gita-Parayan which was followed by enlightening discourse 'cling to Gita' of Rev. Sri Swami Maharaj, highlighting how to be free from all obstacles of life and practical tips to live Gita in daily life for peace, joy & illumination. 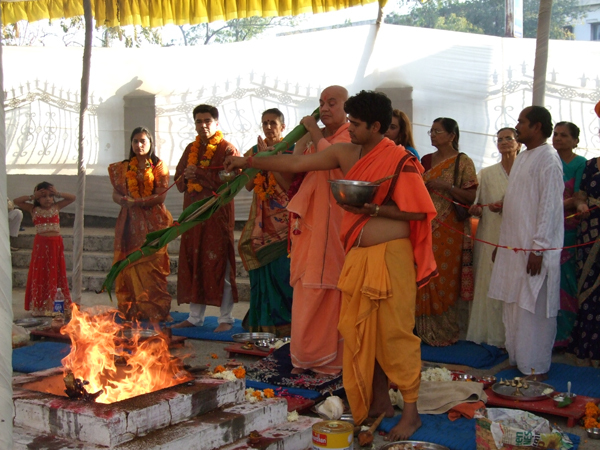 Sri Dattatreya Jayanti was celebrated with Sri Datta Yajana at Sri Dattatreya Temple of Sivananda Ashram, Ahmedabad. A grand Homatmak Laghu Rudra was performed at Sri Vishwanath Temple – Yajna Shala. About three hundred devotees participated in the Yajna worship and had Mahaprasad at Sivananda Annapurna Bhawan. Students of YTTC held a special satsang on Christmas Eve with great enthusiasm, singing Christmas carol and Hymns from Holy Bible in the praise of Jesus Christ and Virgin Mother Mary. H. H. Sri Swami Hansanandaji Maharaj of Swargashram, Rishikesh graced the ashram with his holy presence from Dec 5, 2007 - Dec 7, 2007. 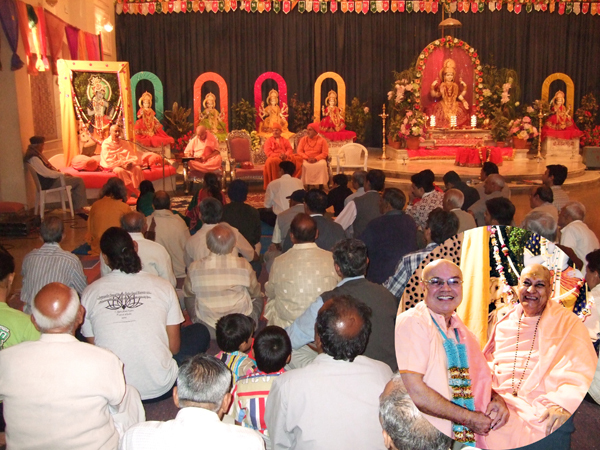 He gave a talk on 'Vedanta" and enlightened the devotees. His annual discourses at the bank of Ganga at Rishikesh in summer are a great attraction to all who get together at Swargashram during summer. On Dec 17, 2007 & Dec 19, 2007 Punya Tithi (passing away) of Sri Ganagananda Mataji and Beloved Dada Prof. Dr. Sri J. N. Moudgill respectively were observed with peace prayer and feeding to the poor. At Mohali: On Dec 1, 2007 at morning he arrived at Mohali and inaugurated new extension of Grover– Sivananda Photo Company. They cherished the memories of Sri Swamiji inaugurated the same firm eighteen years ago. It has flourished with His Blessings to the present status and now installing printing machine worth of Rs. 27 Lacks with modern & up to date computerized printing facilities. At Chandigarh: Dr. Nirmal Bhatia and Sri D. V. Bhatia (IAS) organized Sri Swamiji's satsang at their home at Chandigarh. Sri Swamiji also graced number of devotee's homes and honored an invitation to visit Sri Ashwani Sood Deodar's Gas Station. At Panchkula; Sri Swamiji's Satsang at Panchkula was held in memory of Late Dr. Sri Akshay Guptaji of famous Hero Honda. At Amritsar On Dec 2, 2007 Sri Swami Adhyatmanandaji Maharaj arrived at Amritsar. He visited the memorial place the famous "Jalainwala Bagh". He visited holy Sri Harmandir Saheb (Gurudwara) and Satsang was organized at Rani Ka Bagh. At Jalandhar: In the evening of Sunday Dec 2, 2007 Sri Swamiji Maharaj paid his homage to Divya Prem Mandir, constructed by the devotees of Late Sri Swami Premanandaji Maharaj at Jalandhar. He graced number of devotees by visiting their homes honoring their humble and sincere request. At Ludhiana: On Monday 3rd morning Sri Swamiji's Darshan and Satsang were organized at Rakh Bagh, Ludhiana. A special Prayer meeting and Bhandara was also organized at Nayyar house back of Kabir, Civil Lines, and Ludhiana. Sri Swamiji Maharaj visited Oshwal Woolen Industries also. Visit to Phillaur(Punjab) & Karnal(Haryana): On December 4th Sri Swamiji's visit and Satsang were organized at Sri Dukh Bhanjan Hanuman 140' height. At Phillaur Punjab and Sri Karneshwar Mahadev at Karnal Haryana. At Delhi: Devotees at Delhi were blessed by two visits of Rev. Sri Swami Adhyatmanandaji Maharaj. For both the times Swamiji was in the Capital for attending Grand Gayatri Yajana. Mrs. Kusumben Patel of Gayatri Parivar organized the Yajana on Dec 9, 2007 and famous Hero Honda family organized the Yajana on Dec 16, 2007. At Nainpur - Jalaram Mandir Trust organized Gyatri 125 Kundi Mahayajana by Bhagini Kusumben Patel of Chicago Gayatri Shakti Pith. Pujya Swamiji graced the occasion and blessed the devotees by his enlightening discourse on the subject of "Japa Sadhana". Jamnagar- Three Hundred and thirty years established institute, "Sri Anandababa Ashram", Jamnagar celebrated Centenary of Mahant Sri Shanti Prakashji and Golden Jubilee of H. H. Sri Dev Prasadji Maharaj in a grand scale (festival for fifteen days).Number of prominent saints namely, H. H. Sri Swami Satya Mitranandaji Maharaj, Pujya Sri Morari Bapu, Sri Rameshbhai Oza and others were invited to grace the auspicious occasion, Sri Swami Adhyatmanandaji Maharaj was invited for the concluding of the festivity on Dec 29, 2007. He blessed the devotees with his holy presence and enlightening discourse on the concluding session.